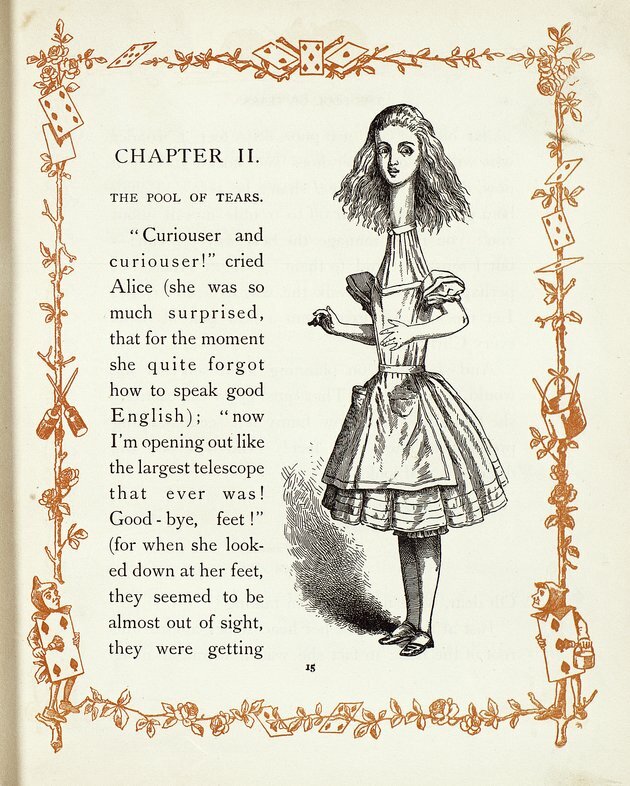 By the beginning of Chapter Two, Alice's physical form has already undergone dramatic changes: the stretching of Alice, as shown in both Carroll's and Tenniel's illustration, offers a first glimpse of the logic of Wonderland's association of physical transformation with changes in identity. Children's literature scholar Peter Hunt has defined these transformations as being at the heart of Alice's enduring appeal, as Carroll "caught the confusion of growing up, changing size and identity, and coming to terms with self and death and sexuality" (79). Perspective is central to the transformations Alice experiences: the tears she sheds while huge become a pool to potentially drown in once she shrinks. The choices made while in one "body" haunt her in another. This does not so much diminish Liddell as it serves to immediately sever Alice from any concrete definition of self. We must consider what we mean when we talk about texts, for—as shown by Tenniel's effect upon Carroll's writings—images and writings are integrated in such a way as to make it impossible to talk about one without calling up-at the least-echoes of the other. The consequences of this are that we work in forms that we call texts, but which are actually integrated image-texts. No matter which media we inhabit with Alice, echoes of Tenniel go hand-in-hand with words of Carroll.